Enduro Standard bearings are great for hubs, bottom brackets pedals etc and are excellent value for money. Here you will find most standard sizes and some non-standard sizes particular. These bearings are made using Grade 10 Chromium Steel Balls, 52100 High Carbon Chromium Alloy Races and Riveted Steel Retainers. Enduro Blue series bearings are ABEC 3 standard with C3 clearance. Depending on the application these bearings use LLU or LLB type seals, although they may be marked 2RS. Dimensions: 20 x 42 x 12 Typical Application: Note: Low noise variant is heavier, 81 g shipping weight. Full Stainless steel construction for corrosion resistance. BB86 - BB30 allows the use of wide 30mm cranks in BB86/BB92 frames. 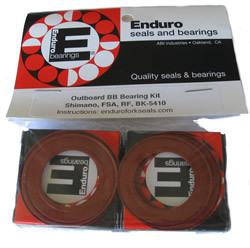 See also Enduro kits BK-7015 and BKC-7015 for these bearings in pairs with seals and spacers. 40 x 53 x 7mm chamfered on all edges. Typical Application: Shimano BB on Trek Madone needing the larger OD because of loose fit. Best used where the double row versions will not fit.